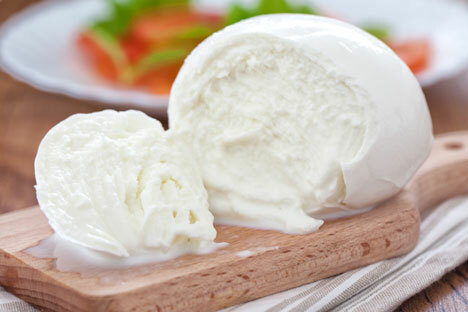 Scientists in Siberia have developed their own mozzarella, mascarpone, and Roquefort, and hope to change the way Russians look at cheeses. The Altarella cheese, or "Altai mozzarella," has been developed by scientists at the Siberian Scientific Institute of Cheese-making. With a taste much like classic mozzarella, it's made of normalized cow milk, Siberian starter cultures and organic acidifiers. The developers claim the process does not require adding harmful stabilizers and preservatives. Another import-substituting development is a smooth cream cheese (a type of mascarpone) with fat content as high as 70 percent. Like its Italian counterpart, this cheese can be used in desserts. Sursele, a version of the moldy Roquefort cheese, has also been developed in Altai. Consumption levels, however, remain small because Russians are not accustomed to such delicacies. Altai scientists are experimenting with enzymes, and are producing mold cheeses with different flavors and ripening behavior. Barnaul cheesemakers patented their technology, and local businessmen can purchase them. But the new cheeses won't soon reach grocery shelves in Moscow, St. Petersburg, and other parts of Russia. Food companies are cautious about new items, and retail chains don't often want to sell import-substituting products made locally. "Russia is far behind France, Germany, and Italy in terms of cheese consumption, and we are limited by a lack of finance to modernize our equipment base and to create facilities for the production of domestic ingredients to make cheese," deputy director for science of the Siberian Scientific Institute of Cheese-making, Vladimir Tkachenko, told RBTH. According to Tkachenko, entrepreneurs interested in cheese production are hampered by tight credit conditions, long-distance shipping and problems dealing with retail chains. Therefore, a significant part of the cheese produced in the region doesn’t reach Moscow and other cities in central Russia. "Most of it is sold only in Siberia and Russia's Far East," Tkachenko said. Experts from Spain, Holland, and France are interested in what Russian cheese makers are doing. The Altai region is cooperating with the French region of Franche-Comte, and a Russian-French cheese college was recently established in the region to educate cheesemakers.